In preparation for next season, here are a few field, office and farm show jobs and WHEN to start them. 1. Manage weeds. Fall is an excellent time to control perennials and winter annuals ahead of next season. 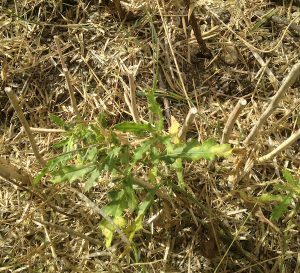 As part of the program, you may want to consider options for “herbicide layering” as well as tank mixing to manage resistance and tough weeds like cleavers more effectively. This involves the use of a soil-active herbicide in the late fall or spring to add incremental control and protect valuable herbicides from resistance. Read “When to spray weeds in the fall”. WHEN: Starting now. 2. Plan herbicide tank mixes to manage tough weeds and prevent resistance. This can go hand in hand with crop rotation. Find more tips here. WHEN: Now and all fall and winter. 3. Review crop performance challenges and determine how genetics can help. Harvest, disease and weed management are each assisted significantly through genetics. Review results from 2015. Was yield the most important selling feature of your canola? How was your weed control? How did it stand? How easy was it to thrash/swath? Canola Performance Trial results from 2016 are not yet available but results from 2011 to 2015 are posted here: canolaperformancetrials.ca WHEN: Start now. 4. Review nitrogen rates and logistics. Do you need to apply more nitrogen? Putting some down in the fall can improve logistics at seeding. Check in here for results from our Ultimate Canola Challenge 2016. WHEN: Late fall or next spring. 6. Soil test. For results as close as possible to the situation next spring, take fall samples when soil temperatures drop below 10°C. Read more. WHEN: Late fall just before freeze up. 7. Deal with ruts to prepare your seedbed for next spring. Read more for tips on how to do this. WHEN: Earlier is better. You want soils loose but also somewhat dry. 8. Asses residue, manage if necessary. Ideally the combine will have taken care of this for you. If necessary, choose harrows to spread residue around. Note that harrows will not do much to move a dense chaff layer, and the first pass through stubble is usually the easiest. Excess harrowing could dislodging anchored stubble, increasing the residue problem next spring. WHEN: Early fall on a hot day. 9. Assess (or review) the disease situation. If a lot of blackleg, for example, start planning for next year. Longer rotations, different varieties and possibly an early fungicide application may be required if the farm has a recent history of more severe blackleg. Read more on disease scouting at harvest. WHEN: As close to cutting — before or after — as possible is the best time to check disease levels. 10. Count stems per square foot. Any canola crop with fewer than 5 plants per square foot is less likely to reach its yield potential. A fall count of stems provides an end-of-season assessment of this year’s stand. Here’s how. WHEN: Any time.